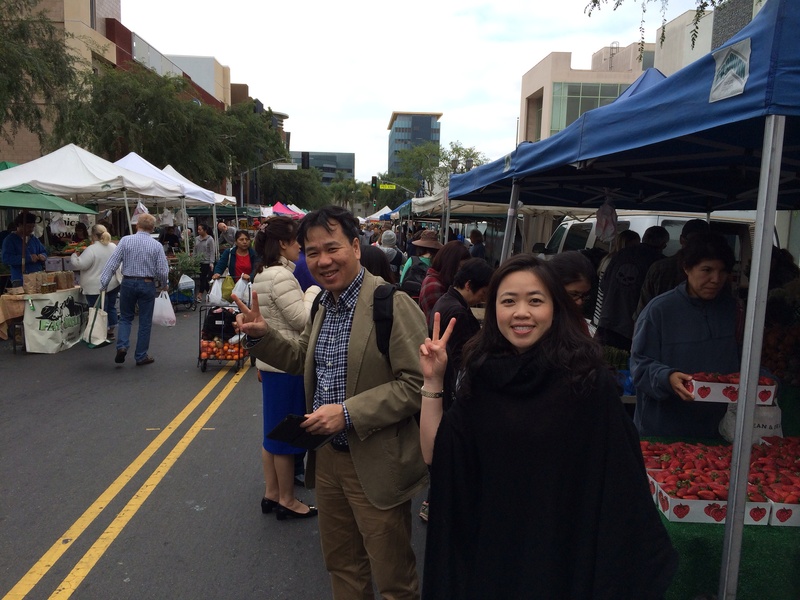 Song Hong Ensemble violinists Phan Thi To Trinh and Pham Truong Son at the Hollywood Farmers Market. I began blogging about my LA International New Music Festival on September 17, 2013. What jumpstarted my story telling was a return trip to Vietnam, my fifth, to reconnect with old friends in Hanoi and see what new developments were underway in their one-of-a-one city, a fascinating burg if there ever was one. My blog is now read in 78 countries with 3600 readers, so a short recapitulation is in order. My attraction for Vietnam is guided by two of the most important people in my life, my trusted acupuncturist Loi Trinh Le and my mother Louise. You can read about Trinh (her English name) in my second post from September. And that September 17th date when I started my blog? That auspicious date would be my mother’s birthday. She’s brought me plenty of good luck hovering like an angel over all of my work in Vietnam. And mom would be thrilled about the recent visit to LA from our friends in Hanoi, the Song Hong Ensemble!